President Harding is a Rock Star has a wonderful cast, a great concept, and some appealing rock music in its too-brief score, yet its woefully limited script mostly stays mired in a juvenile cartoon stage. Carrying most of the burden of this high-energy social satire are two very talented performers, Caesar Samayoa (as Harding) and Simone Zamore as his first lady Flossie. Both have compelling stage presence and transcend the limited script to give their characters badly needed humanity and texture within the creators' comic framework. Samayoa is especially effective at conveying a president whose constant charisma is undercut by character weaknesses and lack of executive ability. (If the current and immediate past president come to mind, consider such thoughts more than a coincidence). 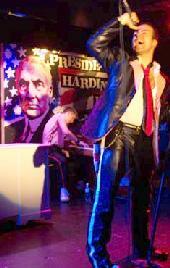 As Harding's almost-always suffering wife in the background (again parallels to historical first wives including Mamie Eisenhower, Jackie Kennedy, and Hillary Clinton surely are being encouraged), Ms. Zamore never misses a beat, and her extraordinary abilities as a singer elevate the show in its final 25 minutes to a rousing experience. The play (perhaps more properly called a theatrical event, for the dramaturgical challenges cannot have gone through much of a gestation period) is remarkably apt, considering how well Harding's package of presidential strengths and weaknesses prefigure contemporary Oval Office considerations. Aspects that deserve more exploration include Harding's unusual rise to political heights, more development of the marital relationship, and attention to the reasons for the minimally-known candidate's extraordinary popular victory of 61%. The role of women helping to choose a president for the first time is nearly ignored. Given the ample political notes in the program, one also is left to wonder why Harding's low-profile successor, Calvin Coolidge, was able to overcome not only the Harding scandals but also a weak economy to easily retain the White House in 1924. The show begins with a genial welcome by creator/pianist Kyle Jarrow who leads his trio in a pounding musical introduction to bring Harding onstage, much in the manner of a famous but failing rock star. Unfortunately, the musical amplification (in a theater with barely 50 seats) overwhelms a lot of the lyrics, and nearly made me leave just to protect my ears. Cue cards displayed to underscore the lyrics suggest that the creators know they have a sound balance problem, yet are happy to flaunt it. The cards might be forgiven if at least they looked professional rather than like hasty props for a grade-school pageant. The early scenes float on chiefly frantic energy, often feeling like a hybrid of a drugged-out version of Bye, Bye Birdie and a 1970-era Hasty Pudding show by Harvard undergrads. Finally, though, President Harding begins to find itself, the lyrics become largely audible, and either the ears adjust or the amplification levels soften. Details like Harding's call to his "band" for a slower tempo and his retort to a complaint that he's "such a child" with "[But] I'm charming, aren't I?" bring the humor to the level that should be the standard rather than the exception for this show. Ultimately, the audience has a chance to not only be fascinated by President and Mrs. Harding and their world, but also to reflect on the socio-political implications of the "everything old is new again" theory. Fantasy sequences with Harding's apparent historical heroes, Alexander Hamilton (check your $10 bills in case you've forgotten our first Secretary of the Treasury) and France's Napoleon buoy the story, as do the presidential indiscretions with very young nubile ladies. The -group scenes involving cabinet members, cocaine parties, and a poker game which finds the White House china and staff assignments in the kitty have potential, but die of sophomoric silliness. Director Alex Timbers has achieved useful variety and strength in his leading players, and an adept ensemble that maneuvers its way around Brechtian in-your-face stylistic changes that include vaudeville, realism and melodrama. If he can (1) get his writer to flesh out the script by both bolstering the leads and finding a third dimension to some of the supporting players and (2) overcome the deafening and unintelligible rock elements of the audience-unfriendly opening segment, President Harding may be able to find broad public appeal. Choreographic additions would also help to invigorate the performing style. The production design by David Evans Morris has a fluid simplicity which suits the constantly changing locales, and the use of Warhol-like images of Harding to reflect his icon-aiming charisma are most effective as the show's visual signature. Costumer Caroline Duncan shines in her combination of '70s style go-go boots and mini-skirts as modified for the flapper era for Harding's groupies. If her sense of humor were applied to the entire cast, the results should give the show added bite. Cast: Jacob Grigolia-Rosenbaum, Ryan Karels, Damian Long, Elizabeth Meriwether, Gerardo Rodriguez, Ceasar Samoyoa, Nandita Shenoy, and Simone Zamore. Onstage band: Kyle Jarrow, Michael Tapper, and Alan Wilkis. Running time: approximately eighty minutes (no intermission). HERE Arts Center, 145 Sixth Avenue at Spring Street. Fridays through Sundays at 7 p.m.
Viewed by Brad Bradley at the Sunday, July 13 performance.